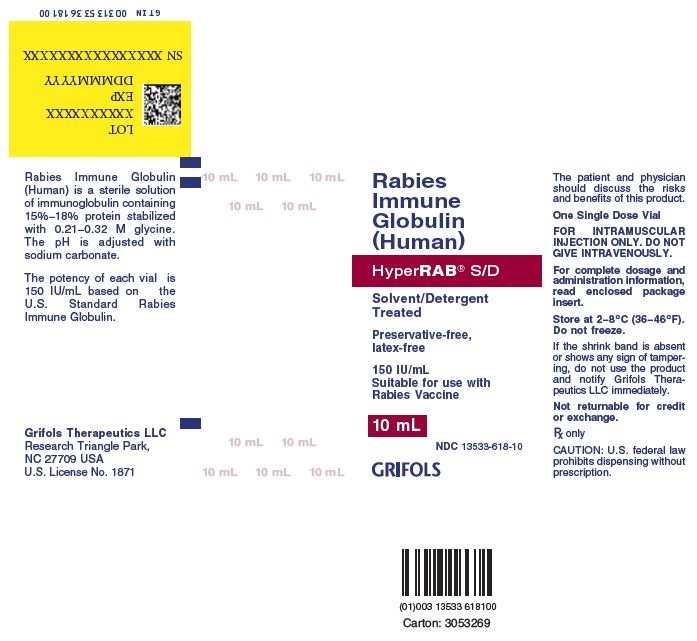 Rabies Immune Globulin (Human) — HyperRAB® S/D treated with solvent/detergent is a colorless to pale yellow or pink sterile solution of antirabies immune globulin for intramuscular administration; it is preservative-free and latex-free. HyperRAB S/D is prepared by cold ethanol fractionation from the plasma of donors hyperimmunized with rabies vaccine. The immune globulin is isolated from solubilized Cohn Fraction II. The Fraction II solution is adjusted to a final concentration of 0.3% tri-n-butyl phosphate (TNBP) and 0.2% sodium cholate. After the addition of solvent (TNBP) and detergent (sodium cholate), the solution is heated to 30°C and maintained at that temperature for not less than 6 hours. After the viral inactivation step, the reactants are removed by precipitation, filtration and finally ultrafiltration and diafiltration. HyperRAB S/D is formulated as a 15–18% protein solution at a pH of 6.4–7.2 in 0.21–0.32 M glycine. HyperRAB S/D is then incubated in the final container for 21–28 days at 20–27°C. The product is standardized against the U.S. Standard Rabies Immune Globulin to contain an average potency value of 150 IU/mL. The U.S. unit of potency is equivalent to the international unit (IU) for rabies antibody. The removal and inactivation of spiked model enveloped and non-enveloped viruses during the manufacturing process for HyperRAB S/D has been validated in laboratory studies. Human Immunodeficiency Virus, Type 1 (HIV-1), was chosen as the relevant virus for blood products; Bovine Viral Diarrhea Virus (BVDV) was chosen to model Hepatitis C virus; Pseudorabies virus (PRV) was chosen to model Human Herpes viruses and other large enveloped DNA viruses; and Reo virus type 3 (Reo) was chosen to model non-enveloped viruses and for its resistance to physical and chemical inactivation. Significant removal of model enveloped and non-enveloped viruses is achieved at two steps in the Cohn fractionation process leading to the collection of Cohn Fraction II: the precipitation and removal of Fraction III in the processing of Fraction II + IIIW suspension to Effluent III and the filtration step in the processing of Effluent III to Filtrate III. Significant inactivation of enveloped viruses is achieved at the time of treatment of solubilized Cohn Fraction II with TNBP/sodium cholate. Studies of the HyperRAB S/D manufacturing process demonstrate that TSE clearance is achieved during the Pooled Plasma to Effluent III Fractionation Process (6.7 log10). These studies provide reasonable assurance that low levels of CJD/vCJD agent infectivity, if present in the starting material, would be removed. The usefulness of prophylactic rabies antibody in preventing rabies in humans when administered immediately after exposure was dramatically demonstrated in a group of persons bitten by a rabid wolf in Iran. [1,2] Similarly, beneficial results were later reported from the U.S.S.R.  Studies coordinated by WHO (World Health Organization) helped determine the optimal conditions under which antirabies serum of equine origin and rabies vaccine can be used in man. [4-7] These studies showed that serum can interfere to a variable extent with the active immunity induced by the vaccine, but could be minimized by booster doses of vaccine after the end of the usual dosage series. Preparation of rabies immune globulin of human origin with adequate potency was reported by Cabasso et al. In carefully controlled clinical studies, this globulin was used in conjunction with rabies vaccine of duck-embryo origin (DEV). [8,9] These studies determined that a human globulin dose of 20 IU/kg of rabies antibody, given simultaneously with the first DEV dose, resulted in amply detectable levels of passive rabies antibody 24 hours after injection in all recipients. The injections produced minimal, if any, interference with the subject’s endogenous antibody response to DEV. In a clinical study in eight healthy human adults receiving a 20 IU/kg intramuscular dose of Rabies Immune Globulin (Human) treated with solvent/detergent, HyperRAB S/D, detectable passive rabies antibody titers were observed in the serum of all subjects by 24 hours post injection and persisted through the 21 day study period. These results are consistent with prior studies [17,18] with non-solvent/detergent treated product. Rabies vaccine and HyperRAB S/D should be given to all persons suspected of exposure to rabies with one exception: persons who have been previously immunized with rabies vaccine and have a confirmed adequate rabies antibody titer should receive only vaccine. HyperRAB S/D should be administered as promptly as possible after exposure, but can be administered up to the eighth day after the first dose of vaccine is given. Carnivorous wild animals (especially skunks, foxes, coyotes, raccoons, and bobcats) and bats are the animals most commonly infected with rabies and have caused most of the indigenous cases of human rabies in the United States since 1960. Unless the animal is tested and shown not to be rabid, postexposure prophylaxis should be initiated upon bite or nonbite exposure to these animals (see item 3 below). If treatment has been initiated and subsequent testing in a competent laboratory shows the exposing animal is not rabid, treatment can be discontinued. In the United States, the likelihood that a domestic dog or cat is infected with rabies varies from region to region; hence, the need for postexposure prophylaxis also varies. However, in most of Asia and all of Africa and Latin America, the dog remains the major source of human exposure; exposures to dogs in such countries represent a special threat. Travelers to those countries should be aware that >50% of the rabies cases among humans in the United States result from exposure to dogs outside the United States. Rodents (such as squirrels, hamsters, guinea pigs, gerbils, chipmunks, rats, and mice) and lagomorphs (including rabbits and hares) are rarely found to be infected with rabies and have not been known to cause human rabies in the United States. However, from 1971 through 1988, woodchucks accounted for 70% of the 179 cases of rabies among rodents reported to CDC. In these cases, the state or local health department should be consulted before a decision is made to initiate postexposure antirabies prophylaxis. The only documented cases of rabies from human-to-human transmission have occurred in patients who received corneas transplanted from persons who died of rabies undiagnosed at the time of death. Stringent guidelines for acceptance of donor corneas have reduced this risk. Bite and nonbite exposures from humans with rabies theoretically could transmit rabies, although no cases of rabies acquired this way have been documented. A properly immunized animal has only a minimal chance of developing rabies and transmitting the virus. If adequate laboratory and field records indicate that there is no rabies infection in a domestic species within a given region, local health officials are justified in considering this in making recommendations on antirabies treatment following a bite by that particular species. Such officials should be consulted for current interpretations. The following recommendations are only a guide. In applying them, take into account the animal species involved, the circumstances of the bite or other exposure, the vaccination status of the animal, and presence of rabies in the region. Local or state public health officials should be consulted if questions arise about the need for rabies prophylaxis. Local Treatment of Wounds: Immediate and thorough washing of all bite wounds and scratches with soap and water is perhaps the most effective measure for preventing rabies. In experimental animals, simple local wound cleansing has been shown to reduce markedly the likelihood of rabies. Tetanus prophylaxis and measures to control bacterial infection should be given as indicated. Active Immunization: Active immunization should be initiated as soon as possible after exposure (within 24 hours). Many dosage schedules have been evaluated for the currently available rabies vaccines and their respective manufacturers’ literature should be consulted. Passive Immunization: A combination of active and passive immunization (vaccine and immune globulin) is considered the acceptable postexposure prophylaxis except for those persons who have been previously immunized with rabies vaccine and who have documented adequate rabies antibody titer. These individuals should receive vaccine only. For passive immunization, Rabies Immune Globulin (Human) is preferred over antirabies serum, equine. [16,19] It is recommended both for treatment of all bites by animals suspected of having rabies and for nonbite exposure inflicted by animals suspected of being rabid. Rabies Immune Globulin (Human) should be used in conjunction with rabies vaccine and can be administered through the seventh day after the first dose of vaccine is given. Beyond the seventh day, Rabies Immune Globulin (Human) is not indicated since an antibody response to cell culture vaccine is presumed to have occurred. ALL POSTEXPOSURE PROPHYLAXIS SHOULD BEGIN WITH IMMEDIATE THOROUGH CLEANSING OF THE WOUND (IF ONE CAN BE DETECTED) WITH SOAP AND WATER. If antirabies treatment is indicated, both Rabies Immune Globulin (Human) [RIGH] and human diploid cell rabies vaccine (HDCV) should be given as soon as possible, REGARDLESS of the interval from exposure. During the usual holding period of 10 days, begin postexposure prophylaxis at first sign of rabies in a dog or cat that has bitten someone. If the animal exhibits clinical signs of rabies, it should be euthanized immediately and tested. If RIGH is not available, use antirabies serum, equine (ARS). Do not use more than the recommended dosage. The animal should be euthanized and tested as soon as possible. Holding for observation is not recommended. Discontinue vaccine if immunofluorescence test results of the animal are negative. lagomorphs (rabbits and hares) Consider individually. Local and state public health officials should be consulted on questions about the need for rabies prophylaxis. In most geographical areas bites of squirrels, hamsters, guinea pigs, gerbils, chipmunks, rats, mice, other rodents, rabbits, and hares almost never require antirabies postexposure prophylaxis. Rabies Immune Globulin (Human) — HyperRAB® S/D is made from human plasma. Products made from human plasma may contain infectious agents, such as viruses, and, theoretically, the Creutzfeldt-Jakob Disease (CJD) agent that can cause disease. The risk that such products will transmit an infectious agent has been reduced by screening plasma donors for prior exposure to certain viruses, by testing for the presence of certain current virus infections, and by inactivating and/or removing certain viruses. Despite these measures, such products can still potentially transmit disease. There is also the possibility that unknown infectious agents may be present in such products. Individuals who receive infusions of blood or plasma products may develop signs and/or symptoms of some viral infections, particularly hepatitis C. ALL infections thought by a physician possibly to have been transmitted by this product should be reported by the physician or other healthcare provider to Grifols Therapeutics LLC [1-800-520-2807]. HyperRAB S/D should be given with caution to patients with a history of prior systemic allergic reactions following the administration of human immunoglobulin preparations. HyperRAB S/D should not be administered intravenously because of the potential for serious reactions. Although systemic reactions to immunoglobulin preparations are rare, epinephrine should be available for treatment of acute anaphylactoid symptoms. Repeated doses of HyperRAB S/D should not be administered once vaccine treatment has been initiated as this could prevent the full expression of active immunity expected from the rabies vaccine. Other antibodies in the HyperRAB S/D preparation may interfere with the response to live vaccines such as measles, mumps, polio or rubella. Therefore, immunization with live vaccines should not be given within 3 months after HyperRAB S/D administration. Animal reproduction studies have not been conducted with HyperRAB S/D. It is also not known whether HyperRAB S/D can cause fetal harm when administered to a pregnant woman or can affect reproduction capacity. HyperRAB S/D should be given to a pregnant woman only if clearly needed. Soreness at the site of injection and mild temperature elevations may be observed at times. Sensitization to repeated injections has occurred occasionally in immunoglobulin-deficient patients. Angioneurotic edema, skin rash, nephrotic syndrome, and anaphylactic shock have rarely been reported after intramuscular injection, so that a causal relationship between immunoglobulin and these reactions is not clear. The recommended dose for HyperRAB S/D is 20 IU/kg (0.133 mL/kg) of body weight given preferably at the time of the first vaccine dose. [8,9] It may also be given through the seventh day after the first dose of vaccine is given. If anatomically feasible, up to the full dose of HyperRAB S/D should be thoroughly infiltrated in the area around the wound and the rest should be administered intramuscularly in the deltoid muscle of the upper arm or lateral thigh muscle. The gluteal region should not be used as an injection site because of the risk of injury to the sciatic nerve. HyperRAB S/D should never be administered in the same syringe or needle or in the same anatomical site as vaccine. HyperRAB S/D is packaged in 2 mL and 10 mL single dose vials with an average potency value of 150 international units per mL (IU/mL). The 2 mL vial contains a total of 300 IU which is sufficient for a child weighing 15 kg. The 10 mL vial contains a total of 1500 IU which is sufficient for an adult weighing 75 kg. HyperRAB S/D is preservative-free and latex-free. HyperRAB S/D should be stored under refrigeration (2–8°C, 36–46°F). Solution that has been frozen should not be used. No warranty, express or implied, including any warranty of merchantability or fitness is made. Representatives of the Company are not authorized to vary the terms or the contents of the printed labeling, including the package insert for this product, except by printed notice from the Company’s headquarters. The prescriber and user of this product must accept the terms hereof. Baltazard M, Bahmanyar M, Ghodssi M, et al: Essai pratique du sérum antirabique chez les mordus par loups enragés. Bull WHO 13:747-72, 1955. Habel K, Koprowski H: Laboratory data supporting the clinical trial of antirabies serum in persons bitten by a rabid wolf. Bull WHO 13:773-9, 1955. Selimov M, Boltucij L, Semenova E, et al: [The use of antirabies gamma globulin in subjects severely bitten by rabid wolves or other animals.] J Hyg Epidemiol Microbiol Immunol (Praha) 3. 168-80, 1959. Atanasiu P, Bahmanyar M, Baltazard M, et al: Rabies neutralizing antibody response to different schedules of serum and vaccine inoculations in non-exposed persons. Bull WHO 14:593-611, 1956. Atanasiu P, Bahmanyar M, Baltazard M, et al: Rabies neutralizing antibody response to different schedules of serum and vaccine inoculations in non-exposed persons: Part II. Bull WHO 17:911-32, 1957. Atanasiu P, Cannon DA, Dean DJ, et al: Rabies neutralizing antibody response to different schedules of serum and vaccine innoculations in non-exposed persons: Part 3. Bull WHO 25:103-14, 1961. Atanasiu P, Dean DJ, Habel K, et al: Rabies neutralizing antibody response to different schedules of serum and vaccine inoculations in non-exposed persons: Part 4. Bull WHO 36:361-5, 1967. Cabasso VJ, Loofbourow JC, Roby RE, et al: Rabies immune globulin of human origin: preparation and dosage determination in non-exposed volunteer subjects. Bull WHO 45:303-15, 1971. Loofbourow JC, Cabasso VJ, Roby RE, et al: Rabies immune globulin (human): clinical trials and dose determination. JAMA 217(13): 1825-31, 1971. Plotkin SA: New rabies vaccine halts disease — without severe reactions. Mod Med 45(20):45-8, 1977. Plotkin SA, Wiktor TJ, Koprowski H, et al: Immunization schedules for the new human diploid cell vaccine against rabies. Am J Epidemiol 103(1):75-80, 1976. Hafkin B, Hattwick MA, Smith JS, et al: A comparison of a WI-38 vaccine and duck embryo vaccine for preexposure rabies prophylaxis. Am J Epidemiol 107(5):439-43, 1978. Kuwert EK, Marcus I, Höher PG: Neutralizing and complement-fixing antibody responses in pre- and post-exposure vaccinees to a rabies vaccine produced in human diploid cells. J Biol Stand 4(4):249-62, 1976. Grandien M: Evaluation of tests for rabies antibody and analysis of serum responses after administration of three different types of rabies vaccines. J Clin Microbiol 5(3):263-7, 1977. Kuwert EK, Marcus I, Werner J, et al: Postexpositionelle Schutzimpfung des Menschen gegen Tollwut mit einer neu-entwickelten Gewebekulturvakzine (HDCS-Impfstoff). Zentralbl Bakteriol [A] 239(4):437-58, 1977. Bahmanyar M, Fayaz A, Nour-Salehi S, et al: Successful protection of humans exposed to rabies infection: postexposure treatment with the new human diploid cell rabies vaccine and antirabies serum. JAMA 236(24):2751-4, 1976. American Hospital Formulary Service. Drug Information. Section 80:04. Rabies immune globulin. Bethesda, American Society for Health-Systems Pharmacy, 1997, p. 2545-7. Rubin Rh, Sikes RK, Gregg MB: Human rabies immune globulin. Clinical trials and effects on serum anti-globulins. JAMA 224:871-4, 1973. Recommendations of the Advisory Committee on Immunization Practices (ACIP): Rabies prevention—United States, 1999. MMWR 48 (RR-1):1-21, 1999. Reid-Sanden FL, Dobbins JG, Smith JS, et al: Rabies surveillance in the United States during 1989. J Am Vet Med Assoc 197(12):1571-83, 1990. Fishbein DB, Belotto AJ, Pacer RE, et al: Rabies in rodents and lagomorphs in the United States, 1971-1984: increased cases in the woodchuck (Marmota monax) in mid-Atlantic states. J Wildl Dis 22(2):151-5, 1986. Hattwick MAW: Human rabies. Public Health Rev 3(3):229-74, 1974. Epidemiologic Notes and Reports: Human Rabies—California, 1994. MMWR 43(25):455-457, 1994. Garner JS, Simmons BP: Guideline for isolation precautions in hospitals. Infect Control 4(4 Suppl):245-325, 1983. Fudenberg HH: Sensitization to immunoglobulins and hazards of gamma globulin therapy. In: Merler E (ed. ): Immunoglobulins: biologic aspects and clinical uses. Washington, DC, Nat Acad Sci, 1970, pp 211-20. Rabies Immune Globulin (Human) is a sterile solution of immunoglobulin containing 15%–18% protein stabilized with 0.21–0.32 M glycine. The pH is adjusted with sodium carbonate. The potency of each vial is 150 IU/mL based on the U.S. Standard Rabies Immune Globulin.